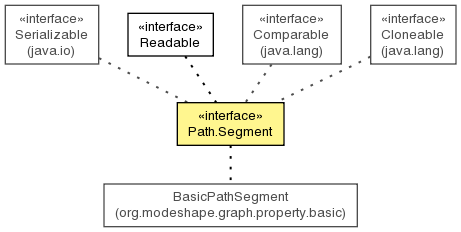 Representation of the segments that occur within a path. Get the index for this segment, which will be 1 by default. Get the name component of this segment. Get the raw string form of the segment using the no-op encoder. Return whether this segment has an index. Return whether this segment is an identifier segment. Return whether this segment is a reference to a parent. Return whether this segment is a self-reference. true if this segment has an index, or false otherwise. true if the segment is a self-reference, or false otherwise. true if the segment is a parent-reference, or false otherwise. true if the segment is an identifier segment, or false otherwise. Get the raw string form of the segment using the no-op encoder. This is equivalent to calling getString(Path.NO_OP_ENCODER).